Just in case anyone's wondering where I've been all November, I should perhaps explain that my blog's been derailed by two things: one is some internet connection issues and the other, perhaps more important and certainly more exciting, is NaNoWriMo. Every year I am convinced that the entire world has heard of NaNoWriMo by now, and every year I'm surprised to come across someone who hasn't. So, since the person reading this might just be that person, I'll explain. NaNoWriMo is short for National Novel Writing Month, and it's a month-long writing challenge to write 50,000 words (the length of a short novel) in... you guessed it... a month. Wish me luck! And if you feel like joining in or just reading more, visit www.NaNoWriMo.org. 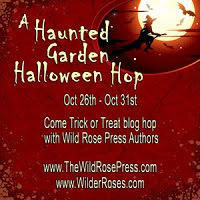 Firstly a huge thank-you to everyone who visited during the Wild Roses blog hop. I hope you enjoyed the hope and maybe discovered some new authors, or rediscovered some old favourites.